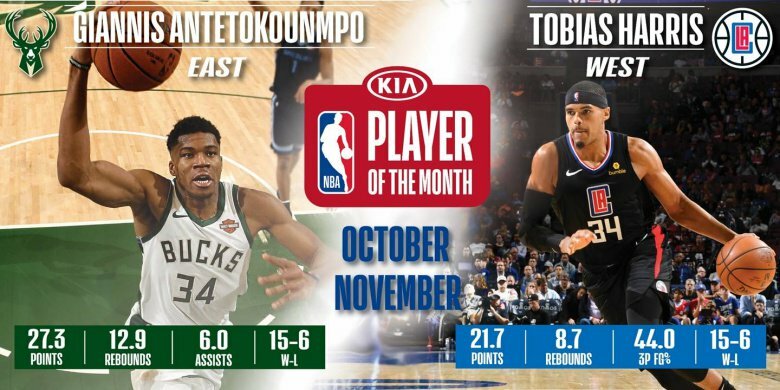 Milwaukee Bucks forward Giannis Antetokounmpo and LA Clippers forward Tobias Harris have been named the Kia NBA Eastern and Western Conference Players of the Month, respectively, for games played in October and November. Other nominees for Kia NBA Eastern Conference Player of the Month were Detroit’s Andre Drummond and Blake Griffin, Philadelphia’s Joel Embiid, Toronto’s Kawhi Leonard, Orlando’s Nikola Vučević and Charlotte’s Kemba Walker. Other nominees for Kia NBA Western Conference Player of the Month were Memphis’ Mike Conley and Marc Gasol, New Orleans’ Anthony Davis, Golden State’s Kevin Durant, Oklahoma City’s Paul George, Houston’s James Harden, the Los Angeles Lakers’ LeBron James and Portland’s Damian Lillard. 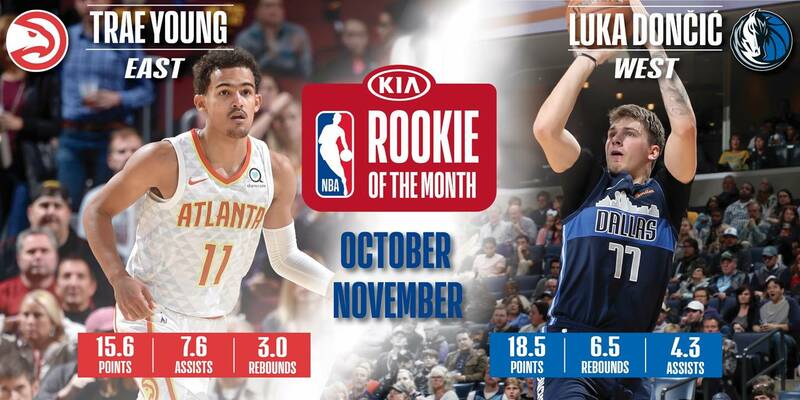 Atlanta Hawks guard Trae Young and Dallas Mavericks guard/forward Luka Dončić have been named the Kia NBA Eastern and Western Conference Rookies of the Month, respectively, for games played in October and November. Other nominees for Kia NBA Eastern Conference Rookie of the Month were Chicago’s Wendell Carter Jr., Cleveland’s Collin Sexton and Philadelphia’s Landry Shamet. Other nominees for Kia NBA Western Conference Rookie of the Month were Phoenix’s Deandre Ayton, Sacramento’s Marvin Bagley III, the LA Clippers’ Shai Gilgeous-Alexander and Memphis’ Jaren Jackson Jr.
Toronto Raptors head coach Nick Nurse and LA Clippers head coach Doc Rivers have been named the NBA Eastern and Western Conference Coaches of the Month, respectively, for games played in October and November. Other nominees for NBA Eastern Conference Coach of the Month were Philadelphia’s Brett Brown, Milwaukee’s Mike Budenholzer, Detroit’s Dwane Casey and Orlando’s Steve Clifford. 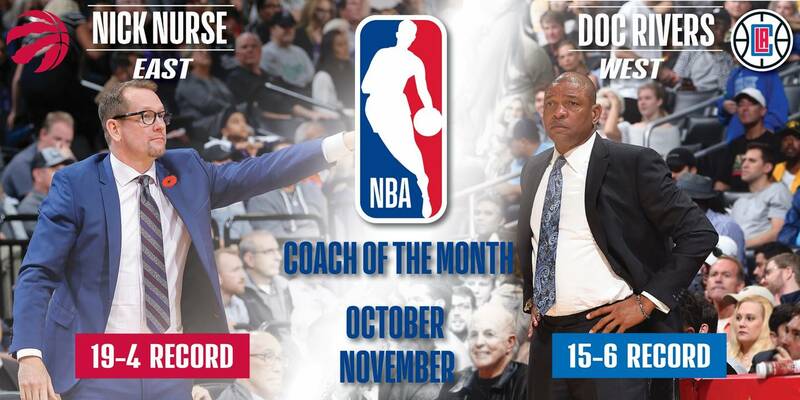 Other nominees for NBA Western Conference Coach of the Month were Memphis’ J.B. Bickerstaff, Dallas’ Rick Carlisle, Oklahoma City’s Billy Donovan, Sacramento’s Dave Joerger, Denver’s Michael Malone, Portland’s Terry Stotts and the Los Angeles Lakers’ Luke Walton.